No specific tests: There are no specific laboratory tests. With suspected infection CSF should be sampled. Triventricular dilation: Enlargement of both lateral cerebral ventricles and the third ventricle with macrocephaly is characteristic of aqueductal stenosis. The degree of dilation is usually marked and progressive. Thin cortical mantle: Levitsky et al. (68) observed a weak relationship between the in utero thickness of the frontoparietal cortical mantle and long-term development, with those patients who have the smallest cortical mantle showing the most severe developmental delay. 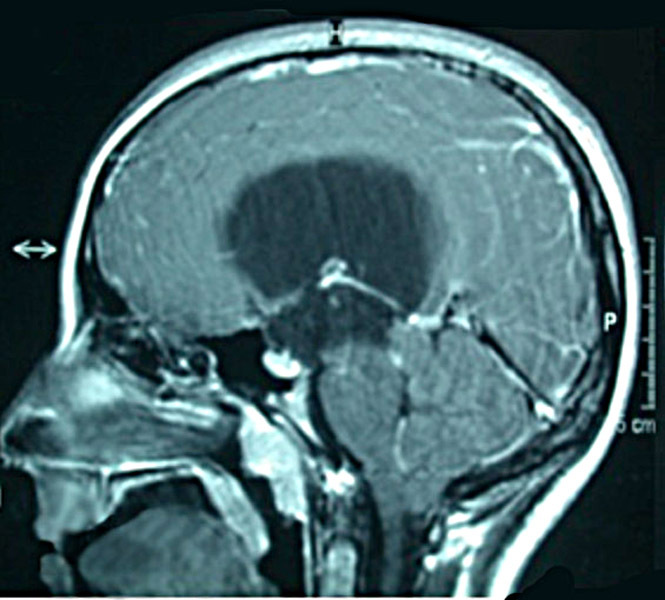 No evidence of Chiari, Dandy-Walker, or other developmental anomalies of the brain: Sonographically, aqueductal stenosis is a diagnosis of exclusion, confirmed only by a detailed examination of the fetal head and spine to rule out other causes of hydrocephalus such as Dandy Walker malformation, Chiari II malformation, agenesis of the corpus callosum, and holoprosencephaly (68). 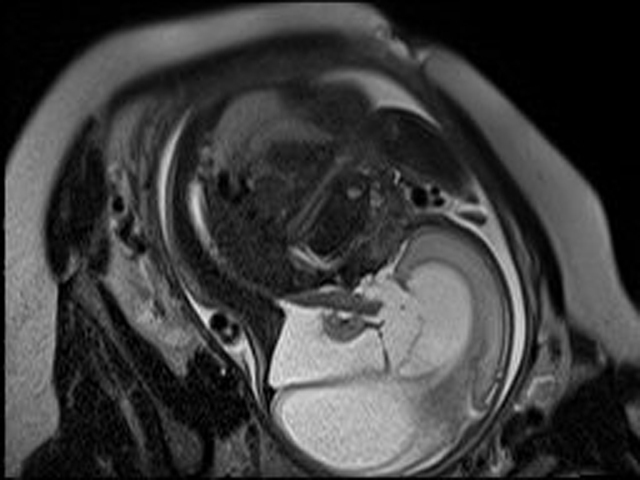 Antenatal MRI may allow diagnosis of aqueductal stenosis by showing hydrocephalus in association with normal fourth ventricle and absence of aqueductal lumen (11). 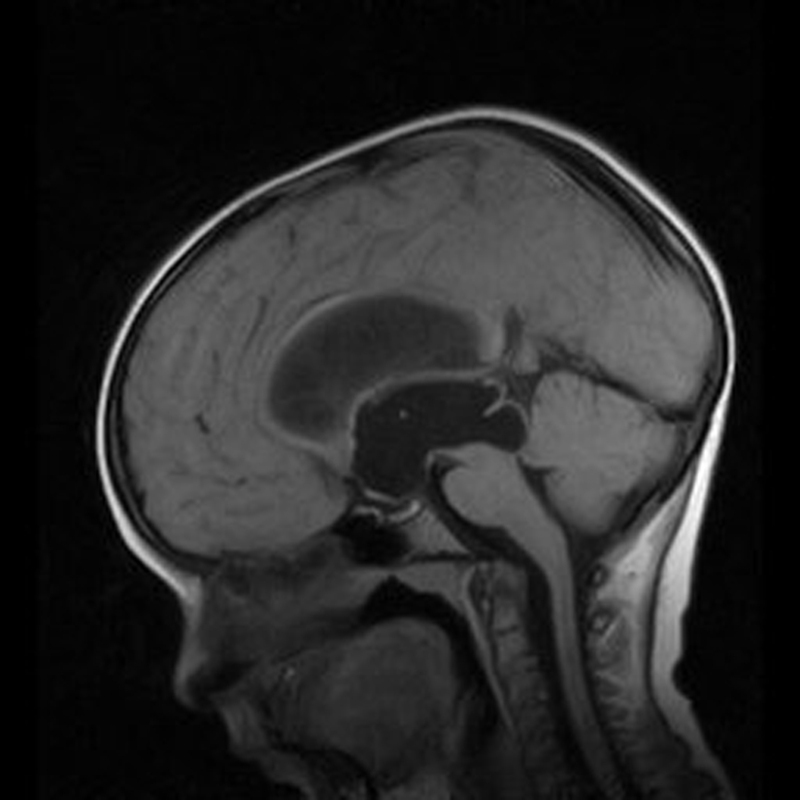 Prenatal T2-weighted MRI: Shown is a fetus in utero with enlarged ventricles. On CT scan, the diagnosis of aqueductal stenosis can be only inferred. Triventricular enlargement: The CT criterion for the site of obstruction in hydrocephalus is the point of transition from dilated to nondilated CSF spaces (76). 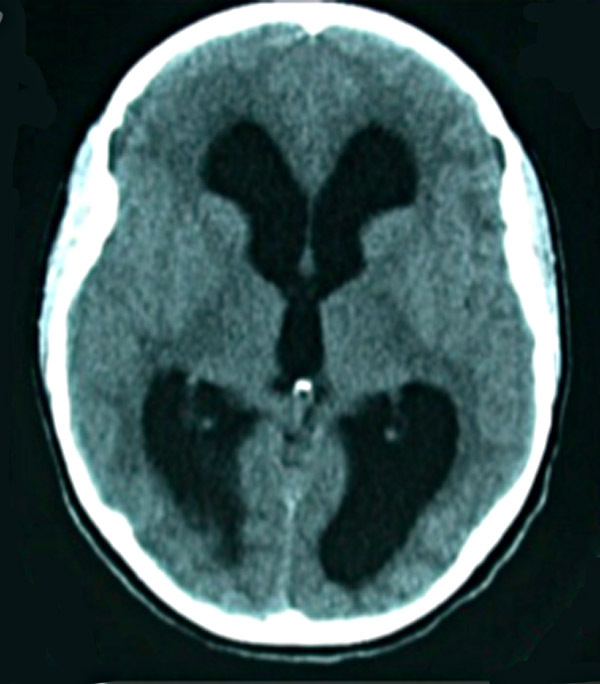 Obstruction in the aqueduct is suggested by dilation of only the lateral and third ventricles (see below) . False positives: Nevertheless, this premise may be misleading. 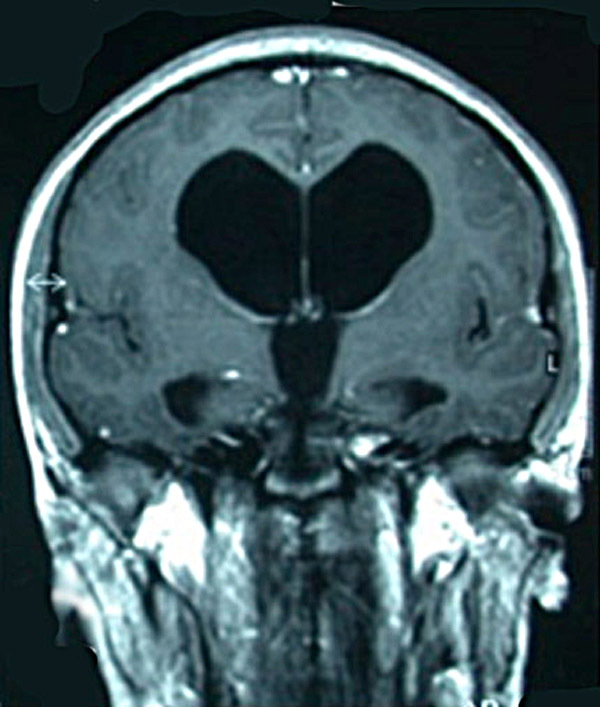 In fact, about 25% of patients with nonobstructive hydrocephalus show little or no dilation of the fourth ventricle. Tumors of the brainstem: CT may fail to exclude the presence of brainstem tumors. Tectal tumors are typically small, isodense with the surrounding brain, and usually show no or poor enhancement after administration of contrast material. Postoperative assessment: In the postoperative period, CT scan is sufficient to assess ventricular size after shunting (11). 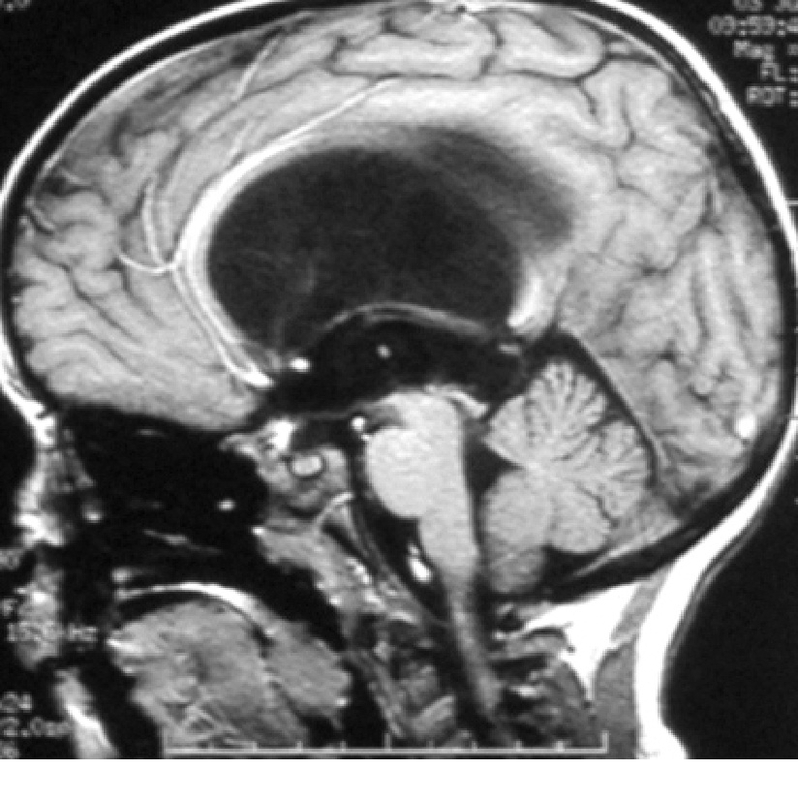 MRI is required for all cases of hydrocephalus to assess the status of the aqueduct and, in case of aqueductal stenosis, to confirm the primary or secondary nature of the obstruction. Moreover, with MRI it has been possible to visualize the entire length of the aqueduct, the downward bulging of the floor of the third ventricle, the anterior bulging of the third ventricle, and the other typical anatomical deformations described above (see below). 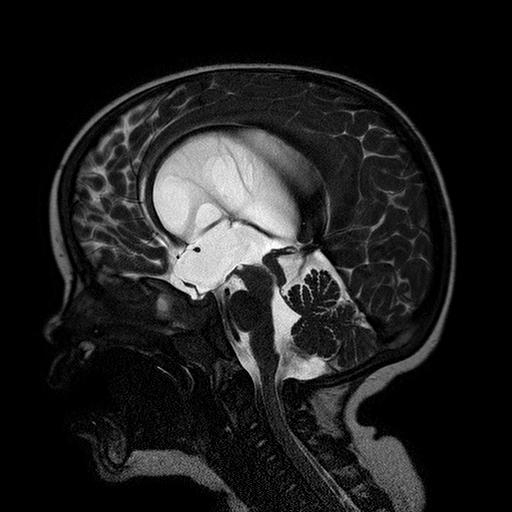 In cases of long-standing hydrocephalus, ventricular diverticula, third ventricle bulging in the chiasmatic and interpeduncular cisterns, and cystic expansion of the suprapineal recess may be detected and correctly explained by both MRI and cine-MRI. 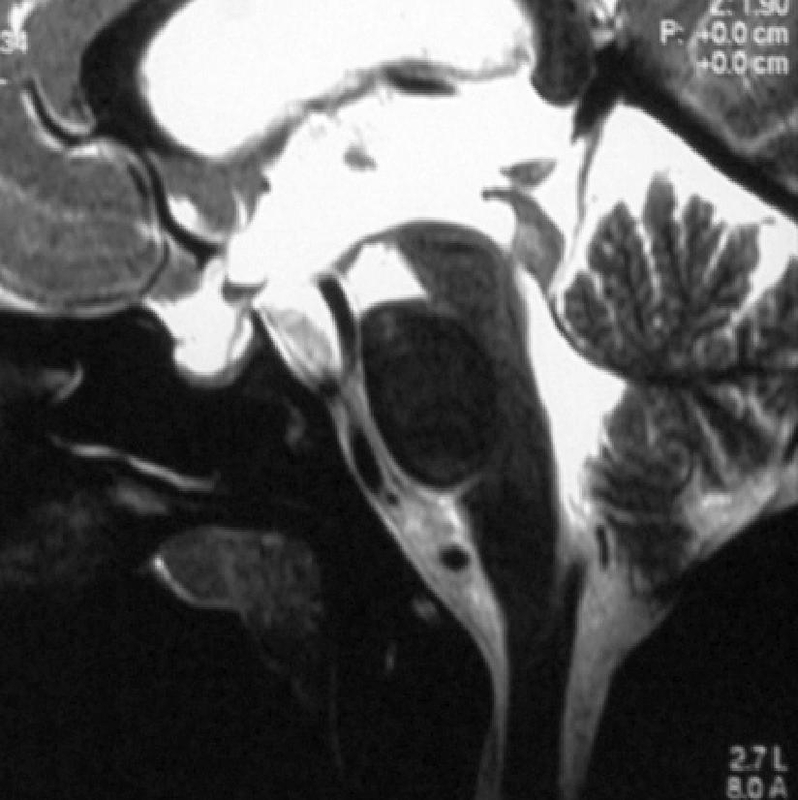 T2-weighted sagittal MRI of aqueductal stenosis: Typical appearance of the third ventricle with downward bulging of the floor into the interpeduncular cistern and expansion of the suprachiasmatic and suprapineal recess. Recommended image orientation: The optimal view for evaluation of anatomical details is a midline sagittal section (11,59). Recommended image sequence: PC-MRI is helpful in confirming the acqueductal stenosis. However, positive flow does not necessarily exclude the existence of aqueductal stenosis. 3D-CISS or DRIVE sequences provide excellent CSF-to-aqueduct contrast, allowing detailed study of the anatomic features of the aqueduct (76). CSF flow void imaging: On T1-weighted images the aqueduct has the same signal intensity as CSF. On T2-weighted sequences, as a result of rapid CSF flow pulsations, the signal of moving CSF becomes hypointense as compared with ventricular CSF (67) (see below). This “flow void” often appears extending superiorly into the third ventricle and inferiorly into the superior aspect of the fourth ventricle; its presence has been considered to be the most important sign for diagnosis of a patent aqueduct (24). 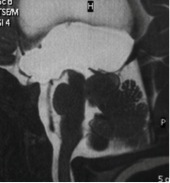 T2-weighted sagittal MRI after ETV: Aqueductal stenosis after ETV with flow void through the floor (upper arrow) and through the Lilliequist membrane (lower arrow). Improving aqueduct imaging: To avoid poor imaging of the aqueduct because of distortion or displacement out of the plane of the section, 3-mm-thick contiguous sections are recommended (59). If the aqueduct is not seen in the sagittal plane or in the axial plane, a long segment of obstruction is suspected. If the aqueduct remains visible, the obstruction is presumptively caused by a membrane (67). Predictive value of flow void: Only 70% of patients without hydrocepalus show this sign, and it may also be present in patients with aqueductal stenosis (98). Several parameters (aqueductal diameter, CSF velocity, section thickness) influence the flow void signal intensity, and it may be weak or absent if the aqueduct is physiologically narrow. As a pathological closing of the aqueduct progresses, the velocity of flow through it may increase, since the same amount of CSF has to pass through the narrowing duct. Only when there is a complete blockage of the aqueduct will the flow void be absent (59). These findings are crucial in deciding whether shunting or ETV would be more indicated and effective. Rapid gradient-echo MRI to assess flow: Flow-sensitive imaging methods have been suggested to better assess the CSF flow dynamics through the aqueduct, in particular RAGE MRI. On RAGE sequences it is possible to differentiate stationary spins from those that are moving; when appropriate technical variables are used, the flow can be demonstrated as having high signal intensity and the absence of flow as having low signal. Cine flow study MRI: Flow-sensitive phase-contrast cine-MRI is more sensitive than static MRI in detecting the pulsatile motion of CSF (see below) (83, 103). The technical standards of cine flow study MRIs are described by Brunelle (10). It is based on acquiring multiple GRE images in the same plane (typically the midsagittal) during a cardiac cycle, starting immediately after the R-wave and acquiring successive images at regular intervals. A specially designed sequence (flow sensitive gradient echo sequence) can accurately measure the flow perpendicular to the plane of acquisition. 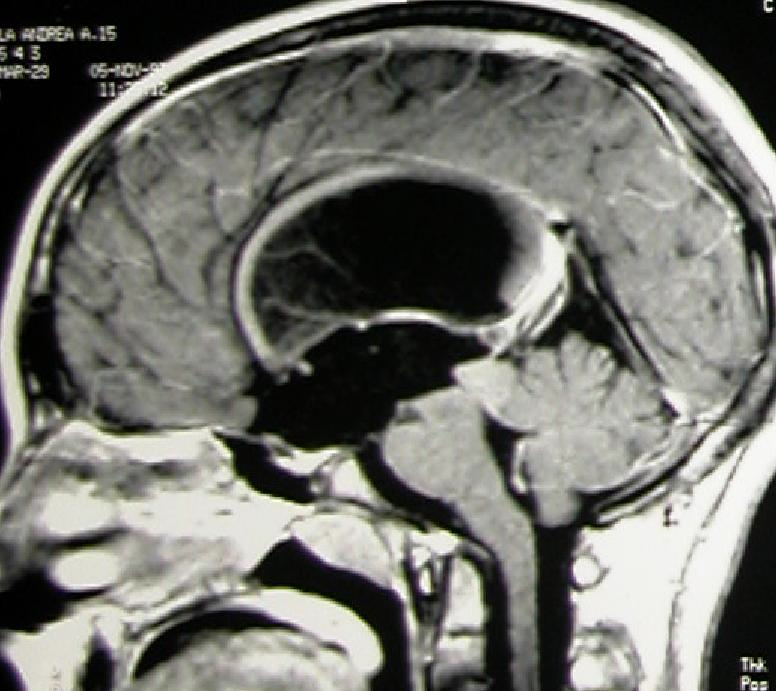 Cine-MRI can be helpful in identifying the level of obstruction in cases of complex hydrocephalus where multiple adhesions or mass are present. The absence of CSF flow at the aqueductal level in phase-contrast MRI is a reliable, reproducible, and rapid way for establishing the presence of aqueductal stenosis in patients with clinical and/or radiologic findings of obstructive hydrocephalus (83,103). Postoperative assessment of flow: The phase-contrast MRI is used to assess the permeability or flow through an ETV (11, 29). 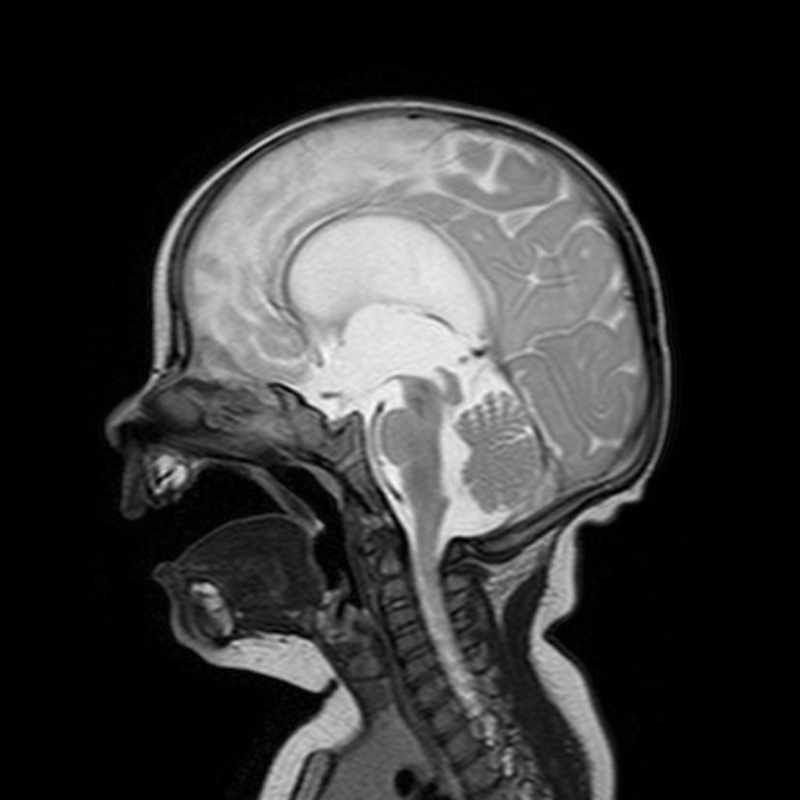 A sagittal scan should be obtained showing the to-and-fro movement of CSF through the stoma between the third ventricle and the pre-pontine cistern. Ultra-thin T2-weighted sequences to image causation of obstruction: High-resolution images such as the driven equilibrium radiofrequency reset pulse or DRIVE sequences or three-dimensional constructive steady-state (CISS) sequences can be used to provide greater detail of the ventricles and basal cisterns (see below). These types of images have an excellent CSF-to-brain contrast and superior spatial resolution that may well identify the causative factors of the aqueductal obstruction such as membranes, webs, hypoplasia, or cysts and tumors (see below) (63,71). T2-weighted sagittal MRI of aqueductal stenosis: DRIVE sequence shows adhesions within the aqueduct. Useful for some patients: When possible, preoperative standardized neuropsychological assessments including the repeatable battery for the assessment of neuropsychological status can be useful in evaluating the long-term neuropsychological outcome in patients with aqueductal stenosis (47,91). Imaging: The correct interpretation of the modern neuroradiological techniques may help in choosing adequate treatment between the two main options (ETV or shunting) for treatment and planning the surgery.